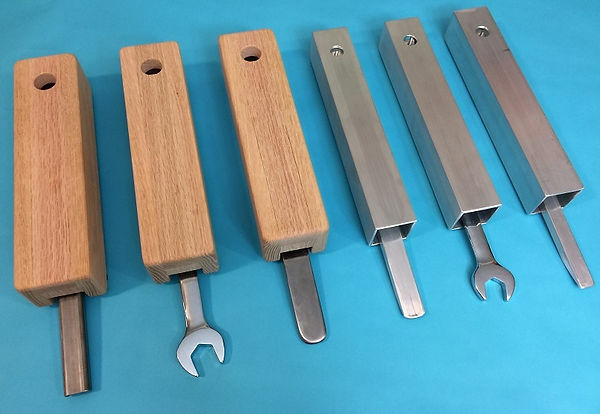 I had more Rhodes pianos than sustain pedals, so I decided to build a few sustain pedals. I’ll show you how to build all the pedals shown in the photo above, and also how to make your own adjustable sustain rod. I recently replaced the grommets on my 73-key 1979 Rhodes Mark I Stage piano. I used the original screws and washers. The new grommets I used are McMaster-Carr 9305K21. I am very happy with the results. The new grommets fit tighter, and are softer than the old shrunken grommets that they replaced. The piano sounds more lush, and has more sustain. I like the McMaster-Carr grommets because they cost nine bucks per 73-key piano. If you don't buy in bulk, and you just buy for only one piano, then the $6.19 shipping cost makes it cost $14.32 per piano. Still pretty cheap. These are the only grommets for which you can find the exact dimensions before you purchase. The McMaster-Carr 9305K21 grommets are made of SBR Rubber (Styrene Butadiene synthetic rubber) - same kind of synthetic rubber that goes into car and truck tires. They are listed as being medium-hard, durometer 60 Shore A. I have no idea how that compares to the grommets of the 1970s nor other grommets from our friendly specialty suppliers. The specs and dimensions of the 9305K21 grommets are clearly shown on the McMaster-Carr website, so you know exactly what you are getting. The Rhodes-specialty suppliers (VintageVibe, Retrolinear, Ken Rich, cvkeyboards, and Avion Studios, etc.) 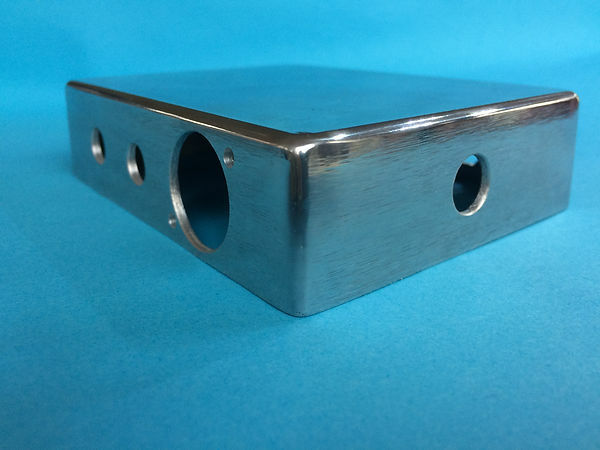 don't show any product dimensions, hardness spec, nor material type. The 9305K21 grommets have an inside diameter of 0.125". The original screws on my 1979 piano have a shoulder diameter of 0.142", so they fit tight inside the 9305K21 grommets. If you have an older piano, your screws might have a larger diameter, so the fit might not work out very well. The fit on my 1979 screws was tight enough to be annoyingly difficult to insert the screw into the grommet. The fit of the grommet into the tone bar and spring is perfect, nice and snug. The McMaster-Carr 9305K21 grommets are not beautifully molded, nor rounded and tapered. There were some that had a lot of mold flashing that needed to be ripped away, but there were no rejects. I don't think that a rounded top or tapered stem would make a significant difference in installation nor sound. I would definitely choose these grommets again. There are at least two Rhodes-specialty suppliers that sell grommets that are indistinguishable from the McMaster-Carr grommets. I assume that they are identical, and sourced from McMaster-Carr. It took me a few days to get the grommet job done, and it was not much fun. I worked ten tonebars at a time, but it still took me a more than an hour to get ten tonebars done. The wax is a small annoyance, and it is nice to have that all vacuumed away and buffed off the tonebars and springs. What a mess that stuff is. The biggest problem is bent screws. Not many are still straight. I wonder if the original builders installed the tonebars, adjusted the intonation, and then hammered any tilted or twisted tonebars until they looked perfectly straight for the quality control or acceptance inspectors. The original screws are pretty soft and irregular. I straightened the ones that were horribly bent with a few hammer taps. This is not a very precise method, but it made the worst screws less hateful. It is no wonder that Vintage Vibe decided to use modern screws and matches their grommets to those screws. This would save a lot of time in maintenance, and provide a much higher-quality mounting system. I recently built a nice simple headphone amp to use around the house with my Rhodes pianos and electric guitars. I used a module built around the TDA1308 headphone driver chip - www.nxp.com/documents/data_sheet/TDA1308.pdf. 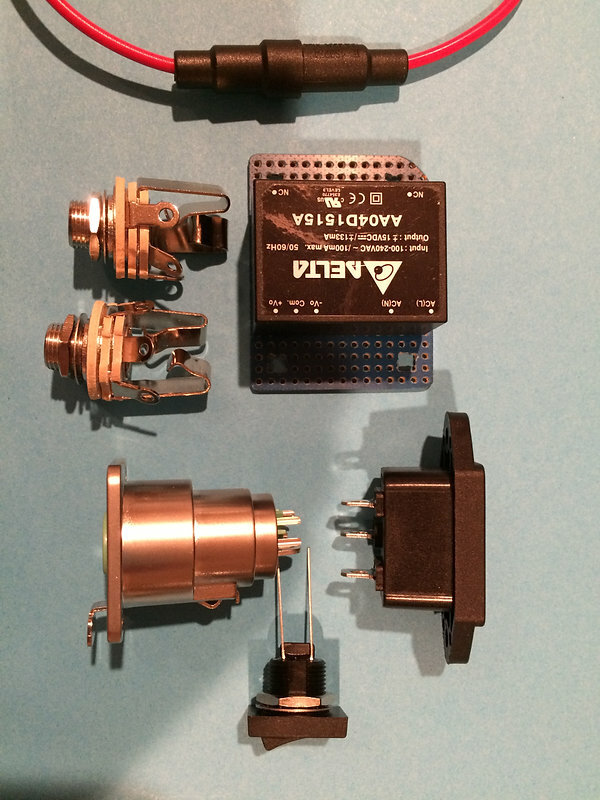 The module I bought is the red one on Amazon (search for TDA1308). I bought mine from seller Qianson, because it is fulfilled by Amazon. I bought a few of them last year, when it was a bit cheaper (about six bucks). The identical module is available from a bunch of different sellers, so you can get them for under two bucks if you buy five or ten and wait for snail mail. The module comes with zero documentation, so I got a magnifying glass and reverse-engineered it. The Amazon sellers have very detailed photos, and it is a really simple circuit, so it was an easy job. I have one multimeter that can measure capacitance, so I have made estimates of the capacitor values used. This circuit board is complete with input and output capacitors, so you don't need any external components except the connectors. It provides plenty of gain (I have to turn my Rhodes stage piano volume knob down to six or seven), and it works well with electric guitars. The finished project sounds great (very clean and noiseless), and is plenty loud. This project cannot be constructed economically, because you can buy something pre-made for cheap. This project can't compete for price unless you get the TDA1308 board for cheap, and use an old plastic container for the chassis. Behringer sells the MicroAMP HA400 and the MicroMON MA400 for twenty-five bucks. I haven't tested either, but I expect they aren't too hateful. Pyle PHA40 is even cheaper. However, all of these products have two problems: they expect line-level input, and they don't run on batteries. Then it gets really ugly if you search for a "guitar headphone amp." There are a number of tiny little devices that might be acceptable and run on batteries. The Monoprice 611500 costs twelve bucks; and it must be awesome, because they clearly state "Pro Audio" on the label. 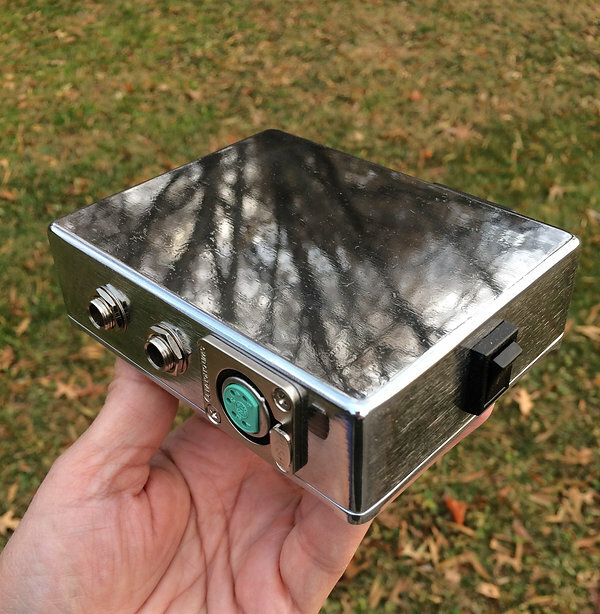 So I can't tell you that this project will save you money, but it will provide a high-quality headphone amp that will make you happy. Assorted wire, shrink tubing, solder, and tools from your basement or garage. If you pay top dollar ($7.89) for the little red board, you should be able to gather the materials above for less than twenty bucks. Except for shipping, that will add eight bucks. This also assumes that the plastic box is found for free, and you already have wire, solder, and tools. I used a plastic tub with a screw-on top that was formerly filled with Body Shop Body Butter (the 6.75oz size). It is about two inches tall, and four inches in diameter. It is sturdy enough to support all the connectors, and the lid screws on very securely, but is easy to open when I need to replace the batteries. It worked out great. My second choice was going to be a Tupperware or Rubbermaid food container. There is also a purple-colored board with the TDA1308 available on Amazon. I have not tried that unit. It looks like it implements the "typical application" circuit from figure 4 of the TDA1308 spec sheet (linked above). This purple unit is set for unity gain, which might provide more bandwidth (but we don't need it). The purple unit also has much larger capacitors at the output, which might provide better low-end response (which would be useful on a Rhodes). Maybe someday I will spend the seven bucks to buy one for testing. The Smallest 5-Pin Power Supply sitting with the rest of the family. 1 each Fuse holder, Littelfuse 01500274Z. You could wind up spending more than $130.00 to assemble all the supplies and tools. The items specifically in the shopping list will cost eighty bucks plus shipping from two suppliers (and a trip to the hardware store). This assumes that you got the AC power cord for free, you got the DE5F from Markertek for cheap, and you bought the expensive switch with the LED. You can save ten bucks if you get a cheap switch. You should also buy a few bucks worth of heat-shrink tubing for insulating the connections at the AC power inlet, fuse holder, and the switch. You will need two cans of spray paint: one can of primer and one can of topcoat color. You will have to buy some tools - the step drill and de-burring tool most likely. I assume you already have hookup wire and a soldering iron. See the list of tools that you might need at http://ep-forum.com/smf/index.php?topic=9657.msg53396#msg53396. Before you know it, you have spent more than one-hundred-and-thirty dollars, waited ages for shipping, and you haven’t even starting building the thing. That’s why I recommend that you buy the finished 5-pin power supply from Vintage Vibe, RetroLinear, Avion Studios, CAE, or some other folks. The diagram below shows the wiring connections for a 5-pin power supply built with a Delta AA04D1515A power supply module. This diagram shows it in a much larger box than the CU-473, so that the wiring connections are clearer (and easier to draw). You may notice that I fixed the orientation of the XLR connector with respect to the quarter-inch outs. The XLR is now on the right side (closest to the piano). To make space inside the box for mounting the power supply, I had to move the power switch around to the right side. Cutting the holes for the AC power inlet and the XLR connector is explained in my earlier work, so see http://ep-forum.com/smf/index.php?topic=9657.0 for more detail. This time, I had a step drill with a 24mm stop, so the XLR hole was a simple process. 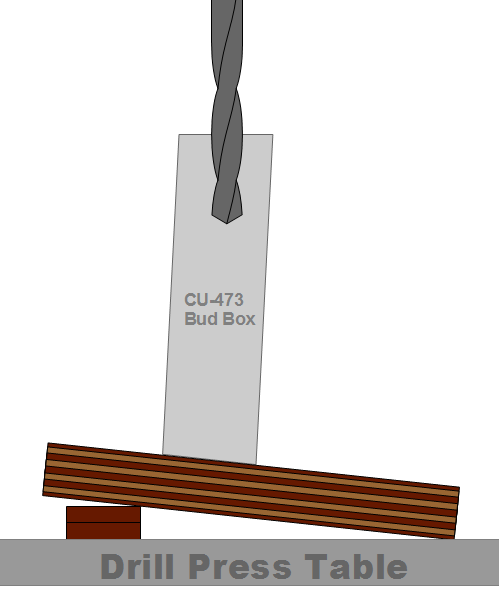 The larger models of Bud Econoboxes have a different draft angle closer to 2°. If you have a fancy drill press with a tilting table, you wouldn’t have any trouble. My drill press does in fact have a table that can be tilted, but I don’t really want to experiment with removing the drift pin (in fear that I will never get the table to be tight and level again). 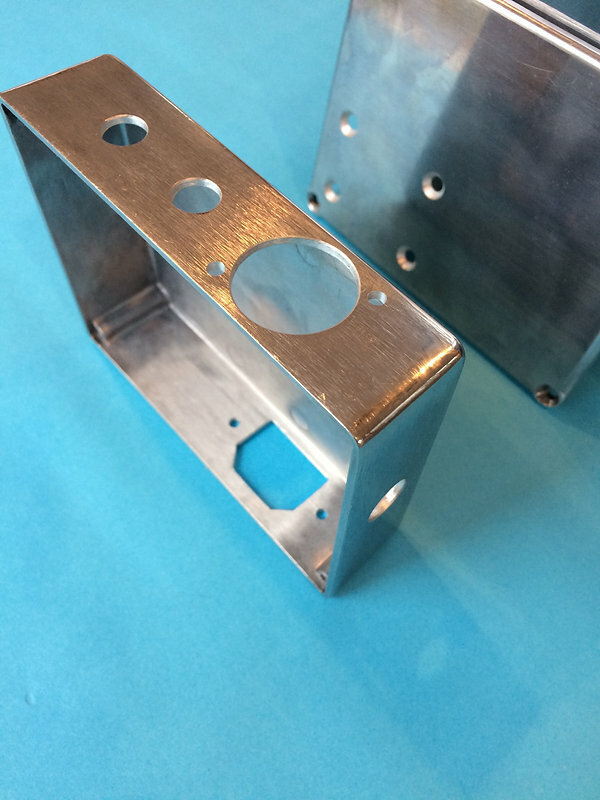 After drilling the holes and polishing or painting the box, you are ready to wire it up. The switch I used cost almost fourteen bucks, and I don’t think I would choose it again. I bought this switch because it didn’t require a large mounting hole and had a power-on indicator LED. However, the solder tabs are tiny, so I could not use 16AWG for the AC power mains. I had to use 20AWG wire, and there was not much room to work. After soldering the connections, I slopped a bit of epoxy over the terminals for permanent insulation. I just noticed that the photo above shows the wrong 1/4" jacks. I am cheap, so I buy Switchcraft 12B connectors in bulk. When I need a mono jack, I simply break off the arm that would connect to the ring, and break off the terminal for that connection. They break off cleanly. Delta has surprisingly little documentation on their website to help with design considerations for their products. I admit that I did not try to contact them directly, so all I had to work with is the spec sheet: http://www.deltaww.com/filecenter/products/download/01/0102/datasheet/DS_AA04S_D.pdf. There is no information about mounting it upside down, no creepage specs, and no example circuits. It does say to use a 1A slow-blow fuse, but I have had good luck with a 500mA slow-blow fuse. The inrush current hasn’t blown a fuse yet. When testing the power supply module, I was not able to get it to heat up at all. Switching power supplies are wonderfully efficient, and are famous for not creating a lot of waste heat. 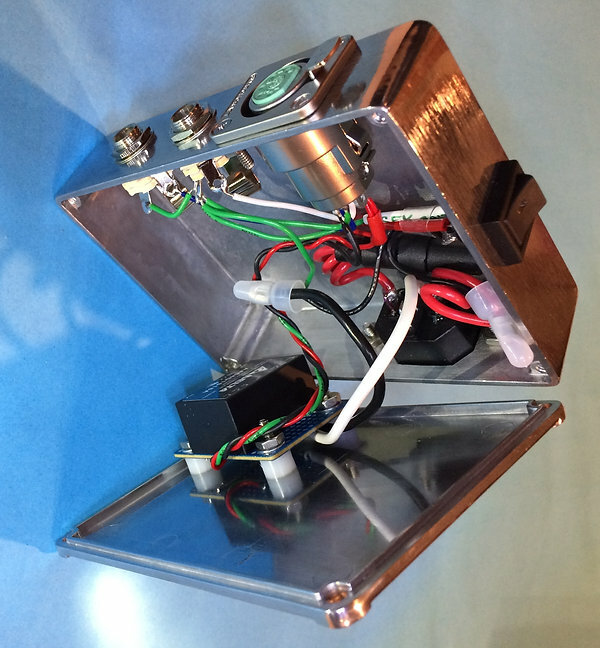 The Delta module needs to be securely mounted to prevent any accidents with the AC power mains connections. It is made to be soldered onto a customized printed circuit board, and the pin spacings are not convenient tenth-of-an-inch centers. I decided to mount it on an epoxy and fiberglass perforated board, so I had to drill out some parts of the perfboard to allow the pins to go through. The module is secured to the board by the solder connections, and four screws hold the board firmly to the chassis. You can cut the glass-reinforced epoxy perfboard down to size with a hacksaw. Grind, file, and sand the edges until they are smoth enough to make you happy. The glass dust is not good for your eyes, nose, and lungs, so wear a dust mask and goggles. Drill a screwhole at each corner of the board. Mount the Delta power module to the perfboard by soldering wires to the terminals. To insure absolute safety during construction and testing, mix up a little two-part epoxy, and coat the soldered connections on the bottom side of the board. With the AC mains connections covered with a layer of epoxy, you won’t burn the house down (maybe). The board holding the power module is screwed to the chassis bottom plate using nylon spacers. The fuse holder is an annoying pain when it comes to stuffing it into the box. You need enough loose wire to change the fuse without too much trouble. I coiled up all the wire, and tucked it into the box, but I doubt that it will look very pretty if I ever have to pull it out and change the fuse. I didn’t use any quick-disconnect terminals, because there is not enough space in the box. There isn’t enough room to mount molex connectors on the perfboard either. When finally put together, it looks really nice and remarkably small. It fits in your pocket. Now, at long last, I am done with this mess. Spoon performed on national network TV with two Rhodes carcasses. Synth player downstage had his main synth sitting inside a stage piano shell, and synth player behind him had his synth setup to impersonate a suitcase. And was that little Richard on the bass drum head? I found an old used Switchcraft D3MB connector in the basement. It is the old-style black XLR panel-mount male. I thought a black XLR would look better on the black faceplate of the Rhodes Janus preamp. I swear I was shopping for a D5MBAU last week, but I didn't want to make the $50 minimum order at the only two websites that have them in stock. A few quick turns on the reverse-threaded screw that holds the 5-pin insert let it slide out the back of the nickel connector. Then I swapped the black connector shell for the nickel one, and pushed the 5-pin insert back in place. The two #4-40 mounting screws were quickly hit with the poor-man's Anodize treatment (black Sharpie magic marker). It was truly a five-minute mod. I am so foolishly pleased with the results! I needed a 5-pin power supply for my Rhodes Janus Preamp. I decided I wanted to build it myself. Since I am a total nutcase, I built five of them. I built them three different ways, tested each method thoroughly, and documented each method so that you can build one too. The Janus preamp requires a power supply that provides +15V and -15V. The 5-pin XLR connector pinout is shown in Steve Woodyard's technotes (http://www.fenderrhodes.com/service/amp-diffs.html). The versions of the preamp with sliders for tone control use only three LM1458 op-amp chips, so they probably draw very little current. The op-amp chips will likely draw less than 10mA each. When you add the current-hog LED indicators, the total preamp consumption is probably less than 60mA. I have the Janus 5-knob preamplifier that is built with four NE5534 and two RC4558 op-amps, so it still only needs a tiny bit of current: a total of 80mA. That’s 40mA from the -15V side, and 40mA from the +15V side (as measured on my preamp). So we need a power supply that provides both +15V and -15V outputs, and it only has to provide less than 100mA from each side of the supply. We are about to go through a lot of hassle for three watts of power. 2. A modern switching power supply. 3. A traditional power supply with a transformer, diode rectifiers, smoothing capacitors, and linear voltage-regulator ICs. I thought that option 3 was going to be the only way to go, but I was surprised to find that option 1 is by far the cheapest and works great, and that option 2 is perfectly quiet and easy to build. Before I tell you how to build them, I want to tell why you should not do it. You should buy the 5-pin power supply from Vintage Vibe for $219, and the 5-pin XLR cable for $65. You get a professionally-constructed power supply that is painted beautifully, and includes a clip to hang it from the handle on the side of the piano. It is fully-tested, durable, and reliable; and it is backed by the Vintage Vibe team. If you are a gigging musician, it is certainly the right way to go. You can build the power supply yourself, but it takes a lot of time, and you don’t save much money. I mean it: you don’t save as much money as you think by building it yourself. It also takes more time than you can believe. 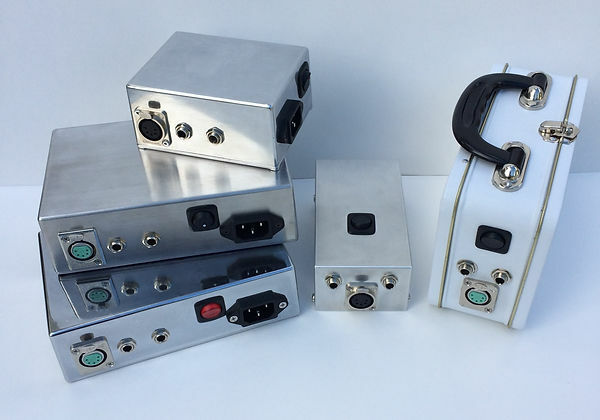 Ordering all the parts, waiting for them to arrive, filing down the rough edges on the enclosure, marking and drilling holes in the enclosure, painting or polishing the enclosure, soldering the circuit together, testing it, installing it into the enclosure – it adds up to a lot of time. If you have to buy any tools, then you will blow the budget. So if you are a pro musician, get it pre-made from Vintage Vibe, RetroLinear, Avion Studios, or CAEsound. If you are not, and you are good with a soldering iron and a drill press, and you know enough about electricity to be safe, you might want to make your own; so read on. If you just got a Rhodes, and you don’t know if the preamp even works, build the battery supply in a cardboard box. It is the cheapest and fastest to build, and great for testing. If you need a backup power supply for gigging or the studio, build one of the switching power supplies. If you have some bizarre romantic idea that a step-down transformer, diodes, filter capacitors, and voltage regulator chips will be best for you – think again and build one of the switching power supplies. If you decide to build one, please read the all the other sections below to get all the tips and tricks that I may not have repeated in each section. TL;DR – It is just simply too long. Give up now. 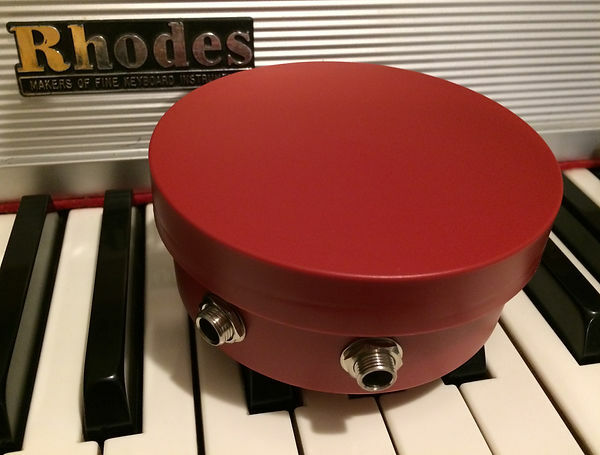 The Fender Rhodes Electric Piano / Flat lid. Flat. Lid. Really flat lid. I was innocently looking at this, when all of a sudden my eyes bugged out when I caught sight of the lid. Flat and smooth. Very cool. Here is my solution for buzzing harp brackets. It keeps the harp brackets from touching the tonebars. I cut the slots using a 5/16" end mill. I should have been more precise with this, but I was in a hurry that day. I just marked approximate endpoints for the slots with a pencil. I then removed the harp brackets from three pianos and took them over to my dad's machine shop. I think I tried to get the slots to be 1/4" from the top edge of the brackets, but after installing them I realized that I could have centered them, or I could have actually measured exactly where the center of the tonebar was. In spite of my haphazard preparation, they all came out looking good and working fine. Note that the slots are not the same length or location on the two brackets. That is because the tonebar sections that would rub against the bracket are different in each location. I don't really know how I would attempt to cut the slots without a milling machine. I guess I could have tried to drill out the endpoints, and then saw between them, but I would never have gotten such clean straight lines. Even with the slots, the brackets are still stiff and strong. Cutting the slots exposes fresh unprotected metal that will probably show some rust in a few years, so I wiped a little oil along the slots. I hope that works well enough. I thought about painting over the exposed metal with clear nail polish, shellac, or varnish; but I took the lazy way out. When they are installed in the piano, you don't really notice the slots unless you are up close and looking for them, so it doesn't destroy the vintage appearance of the piano when the harp cover is off (or on, obviously). For the Rhodes, nothing beats a cable that has a right-angle female connector to plug into the namerail preamp and keeps the cable out of the way of your left hand. The preamp on the namerail has a 5-pin XLR male connector (so it needs a cable with a female end). 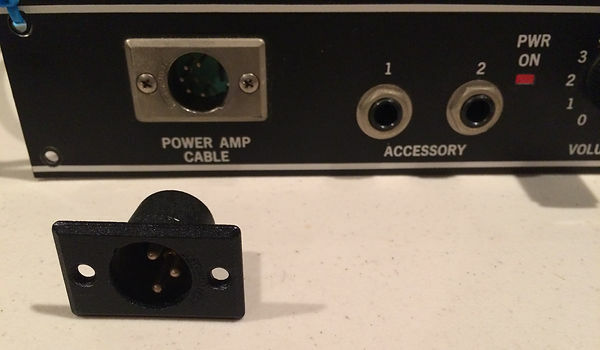 The amp cabinet (or power supply) has a 5-pin XLR female connector (so it needs the other end of the cable, because it has a male end). You can get a great pre-made short cable with the right-angle female from Vintage Vibe or RetroLinear for $65.00. They can make you a custom-length cable if you ask. You can buy 5-pin XLR connectors at any electronics supply website, but I can't find a place to buy short lengths of two-pair microphone cable. But you can buy a pre-made audio or DMX cable, and the cut it to length, and solder on a right-angle female connector. Buying a pre-made cable with connectors is cheaper than buying 1000' of cable. 5-pin XLR cables are being used in DMX512 lighting control, so some parts are becoming cheaper. Beware of the various 5-pin DIN connectors, and beware of the new "mini-" XLR connectors. Beware of all the 5-pin XLR to 3-pin XLR cables available for joining the DMX512 standard and anti-standard universes. Your local music store might have good 5-pin XLR to 5-pin XLR cables (for DMX512 or for the Rode NT4) that you can inspect before purchase. Maybe. I did order a DMX cable with 5-pin XLRs on either end for super-cheap. The cable insulation is marked with www.ds18.com, but not a cable model number. The pins ring out correctly, and the cable works fine with my Rhodes Janus Preamp. The "characteristic impedance" of the cable is unknown. It may be 120Ω. So what? On Amazon.com, I bought the "DS18 MB-5XLR10 XLR Cable 5 Pin Male to Female, 10-Feet" cable for $10.66 with free shipping for Prime. I also got the 25-footer for $19.33. If anybody else has a good source for the appropriate cable, please tell us. If anybody knows the Belden or Gotham or any other wire manufacturer's model number, that would be great. Wiring is pretty straightforward. Pin 1 on both ends gets the drain, shield, wrapper, or ground. Don't connect the connector housing to pin 1: leave the connector body "floating" or unconnected. Then the rest of the pins go straight through: pin 2 to pin 2, pin 3 to pin 3, pin 4 to pin 4, pin 5 to pin 5. The conductors in your cable may be arranged as two twisted pairs, but I can't believe that there are any significant reasons to worry about crosstalk in such a short cable that carries low-voltage analog audio. DMX512 cables should be arranged with one pair on pins 2 and 3, and the other pair on pins 4 and 5. The left and right channels of audio in the 5-pin Rhodes Janus preamp cable are on pins 3 and 4. (See the bottom of http://www.fenderrhodes.com/service/amp-diffs.html.) Don't worry about it. Sources for the connectors are simple. Just check your favorite electronics supply website (DigiKey, Mouser, Farnell, etc.). ITT still makes parts using the old Cannon part numbers under the name ITT Cannon LLC. SwitchCraft and Neutrik make serious top-quality connectors. Amphenol is still around too, but is not cheaper. 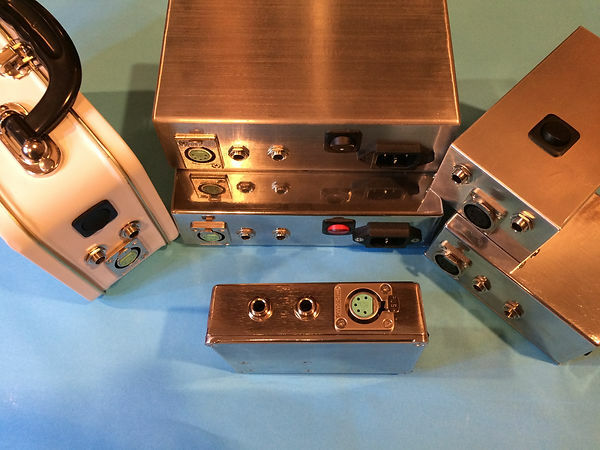 Seetronic, Philmore, and Multicomp are low-cost competitors. Play around with the part number suffixes, and you can find nickel or black finish, gold or silver contacts. If you want the mounting screw holes at the diagonal corners, most brands have a “D-style” version that sometimes also has a raised ring. See Neutrik NC5MD-L-1, Amphenol AC5MDZ, SwitchCraft DE5M, and the Seetronic J5F2C. I thought I should just park this list here. Preamps, Modifications & Upgrades / What OpAmp is used in the 5-pin preamp? Can somebody look inside their 5-pin preamp with sliders and tell me what dual Op Amp chips were used? The service manual doesn't say. They only identify it as Rhodes part number 013528. Was it LF353, TL082, NE5532, or lowly uA/LM1458? And what is the assembly and part number printed on your circuit board (015244/015245 or 013487/__)? P.S. - I have a 5-pin preamp, but it is the model with five knobs. It uses four single-channel op amps for the audio paths, and two dual-channel op amps for the tremolo oscillator and LDR drivers: four NE5534 chips and two RC4558 chips. Can you drive down to Torrence, and show them how to put the top on this Rhodes 88? I really like using tapatalk to check the forum from my iPhone. I just use the free version, so if I wanna reply, I will wait until I am in front of a big screen. Thanks for hooking that up, and thanks for posting the pointer to it in the announcements. The Fender Rhodes Electric Piano / Dimensions of wood action rail... and harp supports too. Could you measure the dimensions of the wood strip that supports the action rail and also the dims of the harp supports for me? I need the size of the wood strip that sits under the action rail. I have the action rail and the key frame, but not the wood in between. In the drawing below, the action rail is the cross-hatched piece that the hammer flanges and dampers are screwed into. I need the size of the piece of wood that is above where the arrow labelled "SHIMS" points to (in the top part of the drawing below). While you are crawling around inside your piano, could you also tell me how tall the harp support blocks are? The Fender Rhodes Electric Piano / The Check is Back! Is this the same one that was posted months ago, or is it a zerox of it? Check out the logo on the namerail. Cool decal. Also notice the shape of the felt hammers. I guess there is not enough space in there to use regular piano hammers. It looks like the pickups were wound without any nylon bobbin. It almost looks like the pickup is mounted with a screw that goes right into the magnet/rivet with no ability to adjust forward or back (and not much room to get in there and repair or replace pickups with a soldering iron). It would be interesting to see that up close. Are the tonebars cast out of zinc or lead? I bet zinc. It looks to me like they are mounted to the u-shaped support bar/truss by a single screw near the front, and the smaller screw next to that might be used to align it up/down in relation to the pickup tip. You can see that the u-shaped trusses are isolated with a felt strip and felt punchings around the mounting screws. I guess there are springs and felts underneath the u-shaped bars to allow the tonebars to vibrate. I love the walnut cheekblocks and name rail. Shame that the cheekblocks seem to have been sanded across the grain - or maybe that is checking in the lacquer finish. I can't tell for sure from the angle of the photos, but it also looks to me that the white keys keycaps are not the same full-skirt rounded-top keys that were used in the early seventies (73/74 for sure). The black keys look the same as I remember with the not-very-rounded front corners. Cool photos. Am I the only one geeking-out over them? 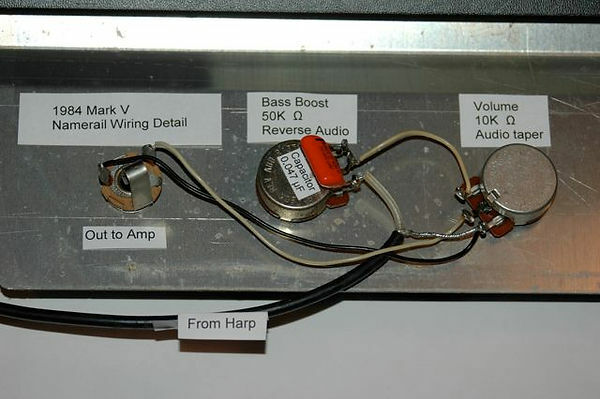 Here are the complete directions for splitting the pickup rail to provide a bass output and a lead output, and adding a switch to change from whole-harp to split-harp. It took longer to create the drawing than it took to do the mod, but I had fun doing both tasks. 1. I won't drill any new holes in my piano's name board or chassis. 2. I won't modify the Volume and Bass Boost circuitry on the name board. 3. The Volume and Bass Boost controls must still work after the mod. 4. I did not want to re-wire the RCA jack on the pickup rail. 5. I did not want to mess around with any of the ground wires or foil tapes. 6. I didn't want to spend much money. Twenty bucks max. 7. I wanted the mod to be 100% reversible. Minimally intrusive surgery. Take a look at the drawing below, and I'll explain what I did. Divide the pickup rail into two sections by cutting the jumper wire opposite an existing break (otherwise, you will orphan a pickup). Solder your take-off wires to these freshly clipped ends. Temporarily remove a tonebar assembly on either side of the split to give yourself room to work. The drawing below shows you how to wire a three-pole double-throw switch to select between the whole harp and the split harp configurations. The switch is shown from the back side with the toggle pointing away from you, and turned so that the toggle flips from left to right (NOT up-down). Since the switch terminals are a three by three grid, you may have some confusion about how to hold the switch so that it matches my diagram. Don't use the visual depiction of the solder lugs in my drawing as the guide for holding your switch in the right position! Use the movement of the toggle from SIDE TO SIDE be the indicator of proper switch position. The wires are drawn as thin or thick ONLY to make it clear that they do NOT connect when they cross each other in the drawing. DON'T CUT THE WIRES ON THE PICKUP RAIL UNTIL THE LAST STEP! This way, if you have any interruptions in the construction process, your piano will still be gig-ready. 1. Buy a small 3PDT switch. 3PDT means three-pole double-throw. You want a miniature toggle switch without a center-off position. You want ON-ON operation, not ON-OFF-ON or ON-NONE-ON. 2. 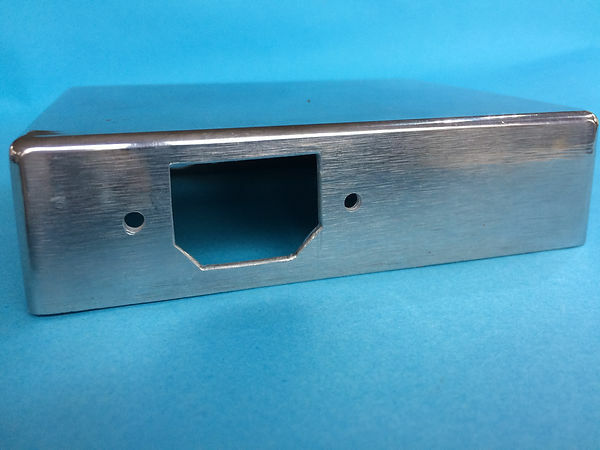 Get a panel-mount female RCA jack. I used a cheapie from Radio Shack. Four bucks for a bag of four. You also need a 1/4" jack. 3. Get a good quality three-foot RCA-to-RCA male-to-male cable and cut it in half (you need about 18 inches). Strip and dress the cut end so that you can solder the center conductor and shield braid. This cable will go from the RCA jack on the pickup rail to the splitter switch. 4. Get three feet of top-quality shielded microphone cable. You do NOT need rugged thick mic cable that you would use on stage, just any two-conductor-plus-shield cable. I used Belden 8451. This cable will go from the split point on the pickup rail to the splitter switch. You will not need the shield conductor at the pickup split point, but you must connect the shield conductor at the other end of the cable to the ground point of the splitter. 5. Choose a little box to build it in. I used a plastic box from Radio Shack, but it isn't rugged or sturdy. 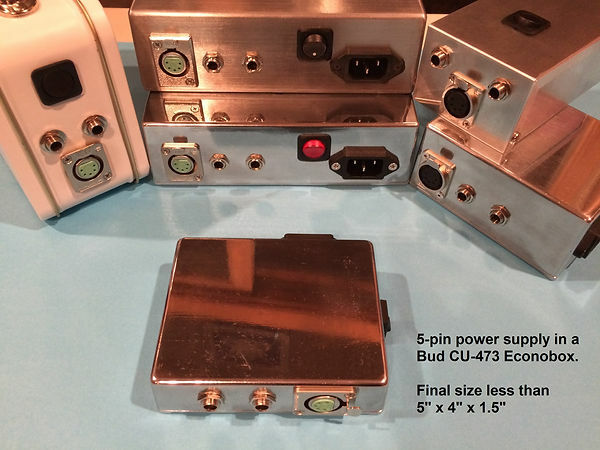 (I think I will get a diecast aluminum Bud box. I want to build it in a tiny Bud CU-123 or CU-470.) You will have to drill a 3/8" hole for the output jack, a 1/4" hole for the switch, a 1/4" hole for the RCA jack, and a small hole for the two cables to exit the box. Mount the switch, 1/4" jack, and RCA jack in the box, and screw them in tight. 6. Do not solder anything until you have ALL the wires routed and pinched tight to the terminal lugs. Get a few inches of insulated jumper wire and make the connections on the switch as shown in the diagram. When you have all the connections in place, and have double checked them for correctness, solder them for perpetuity. Solder the connections at the RCA jack and 1/4" inch jack. You should now have the whole assembly ready for action, except that it is not connected to the piano. It should look like a box with two cables hanging out: one cable has the RCA plug, and the other will eventually be soldered to the pickup split point. 8. Now you can get ready to connect the splitter circuit to your piano. Protect the keys from damage with a thick bath towell (I cover them with a wooden board). You do not want any solder to fall off your soldering iron and splatter onto the keys. Better safe than sorry. Take-off wires soldered to pickup rail. Notice that I didn't bend the ends of the wires and hook them together. The straight wires are much easier to un-solder if I ever want to remove the splitter and clean up after myself. If you are going to gig or move your piano, you should secure all the cables with wire ties to keep them from flopping around or tugging on the pickups. Replace the piano top cover, and you are done! Plug in two amps and play. Here are some photos of my prototype and finished project. This photo gives you a clear idea of how the circuit inserts into your piano signal path. The regular output and controls still work. Even without drilling the name board, the splitter box can stay out of the way, but it is handy when needed. If you made a serious committment to this mod, you could drill holes into the name board for the switch and the 1/4" jack. 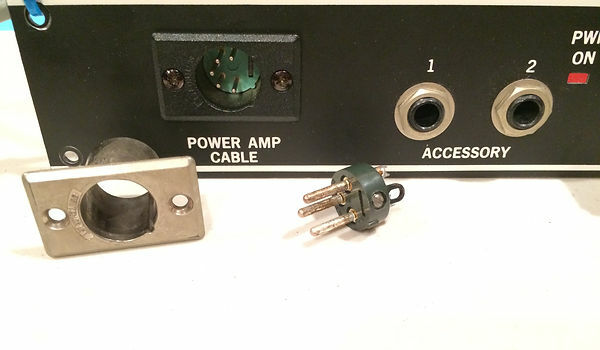 You could replace the panel-mounted RCA jack with a female RCA cable, and secure the connections with wire ties, and tuck the wires next to the harp support. I recently re-drew the schematic for the Volume and Bass Boost circuit on the Stage Piano nameboard. My diagram matches my three 73-key stage pianos from 1979, 1981, and 1984. James and I would like to know if there were stage pianos that were wired differently in earlier years. Could some of you owners of earlier pianos take a critical look at the wiring on the back of your nameboard, and tell us if they match my schematic (or my photo)? Either compare yours to the schematic and photo below, or post a photo, and I will compare. Buying / What a LIAR... "I don't have an amp"
There is a Rhodes Mark II stage 73 on ebay for an outrageous price with beautiful pictures but lame description. Item 170203397744. 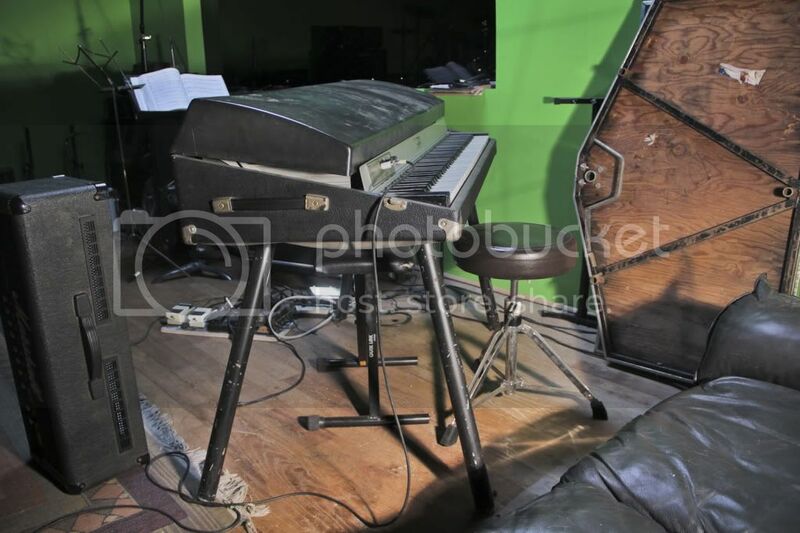 The seller claims that he doesn't have an amplifier to test the piano, however in three of his photos, you can clearly see a Hughes and Kettner amp in the background. Amusing. Hmmmm... would I trust this seller? Still, that is not as bad as the seller in Taiwan who claims his Rhodes is "New Old Stock" and wants three grand for it. I was able to buy three Rhodes on Ebay without a problem. I guess I got lucky. The Fender Rhodes Electric Piano / White plastic keys... not always black. Take a look at ebay item 250225377184. After you laugh at the price the lister thinks is possible, take a look at the forth and fifth photos. Obviously plastic keys, and obviously not black plastic. Page created in 0.154 seconds with 35 queries.